After the tragic death of Rob, his family and friends decided to help young people engage in sports in different parts of the world. 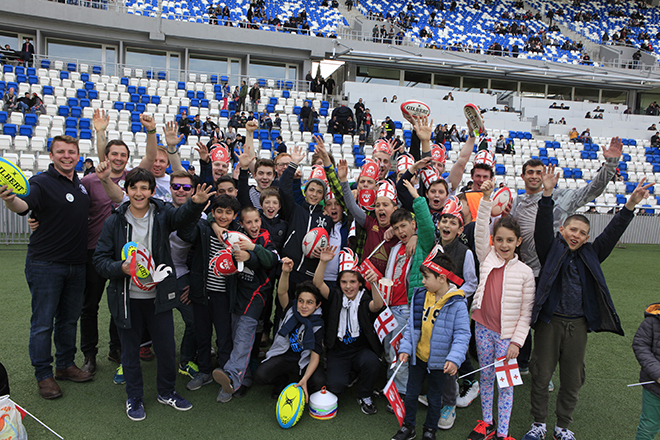 Through an association with John Jeffrey’s Chairman of the IRB’s Rugby Committee they contacted the Georgian Rugby Union and said that they wanted to visit and help young Georgian rugby players. So in total nine of us from the UK travelled to Georgia. Local lads included Rob’s brother Sam Stephenson, Matthew Clark, Sam Harrison and Robert Webster. 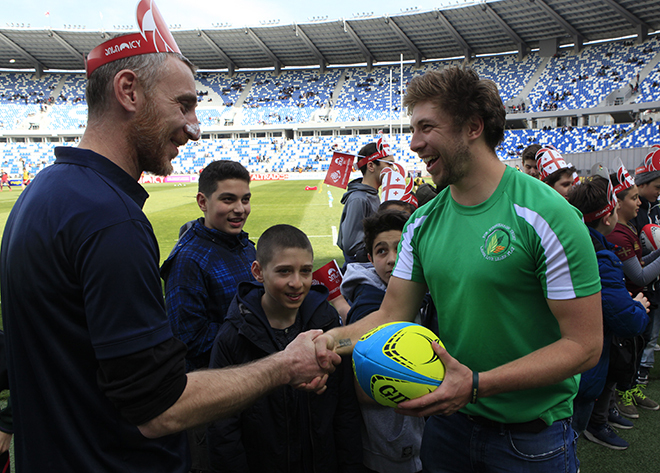 Our aim was to deliver some rugby equipment to the ‘Get Into Rugby Georgia’ project. Georgia sits between Russia and Turkey. We tied the trip in with some skiing in the Caucus Mountains in Gudauri, and fortunately were not on the lift when the ski incident occurred a few weeks ago. 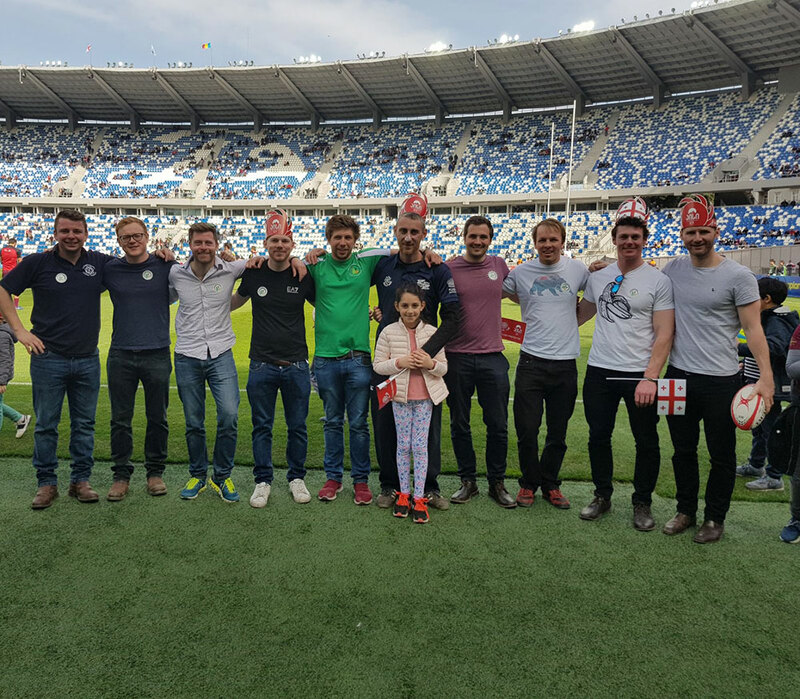 The Georgians were very receptive and took us down pitch side to meet the leader of the program along with a number of the children that had taken part. The program works with over 50 schools in the capital in Tbilisi covering children aged 10-13. They are trying to increase the participation in rugby rates of Georgia’s national sport. We donated two large bags of balls, cones, bibs and tag belts. The presentation was made pitch side before the Georgia v Romania game, who play in the tier 2 version of the 6 Nations. Georgian national TV were present and filmed the presentation. The children were very quick to start kicking and throwing the balls around pitch side emulating their national heroes. As we took our seats in the stand we could still see young children running around the stadium kicking and passing the balls around.